To get started, select the "Remind me" button from the bottom of any note and choose the type of reminder you want to add. You can add time-based reminders for a specific date and time, or a more general time of day, like tomorrow morning. Adding a location reminder is incredibly easy too-as soon as you start typing Google Keep suggests places nearby. Of course, sometimes plans change. If you get a reminder you're not ready to deal with, simply snooze it to a time or place that's better for you. It's now even easier to get to all of your notes using the new navigation drawer, which includes a way to view all of your upcoming reminders in one place. And for people who want more separation between their home and work lives, the drawer also lets you easily switch between your accounts. 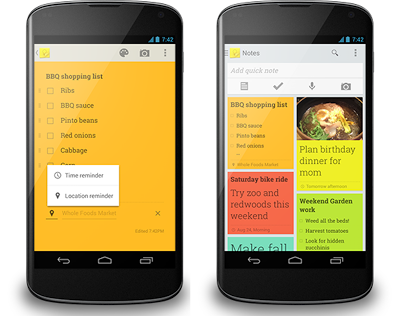 And now, it easier to add your existing photos to a Google Keep note on Android. When you tap the camera icon you can choose between taking a new photo or adding one you already have from Gallery.